Today is World Asthma Day – a day dedicated to raising awareness of the condition. It is thought that as many as 300 million people suffer from some form of asthma in the world – and there are 250,000 death each year linked to the disease. While many other disease are decreasing in number, the cases of asthma continue to increase with the number thought to reach 400 million by 2025. Those affected with asthma often have difficulties breathing due to the lung condition. There is no cure and can affect people of all ages, sometimes being diagnosed in childhood and even later in life. However, some people do outgrow the condition as they get older. 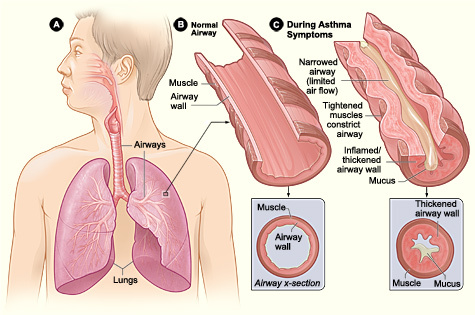 Asthma is caused by swelling in the breathing tubes that carry air in and out of the lungs. This inflamation can mean the tubes narrow, making breathing difficult. The tubes can also become blocked with mucus and triggers include various allergens such as dust mites, animal fur and pollen. Chest infections, exercise, cigarette smoke and gases can also be triggers. Complications of asthma include tiredness, stress, anxiety and depression. Symptoms include wheezing, being breathless, having a tight chest and coughing. Sometimes someone with asthma can suffer an attack – where they struggle to breath – which can be life threatening. While there is no cure, inhalers can be used to prevent and relieve the symptoms. Speak to your doctor for further advice on these. What is World Asthma Day all about? World Asthma Day – May 2 – is a day dedicated to the prevention and treatment of asthma. The date is also designed to improve awareness of the condition with the view to ensuring those with the condition are able to get diagnosed. The day is organised by the Global Initiative for the Prevention of Asthma with the overall aim to decrease the number of people who die from asthma attacks.